Dream Poly has an exclusive blend of these revolutionary microfibers giving it a very soft hand, exceptional drape, breathability and comfort which surpasses all other polyester batts. You will feel the difference! The combination of our special needlepunch processing (like our Dream Cotton) and the use of the finest microfibers eliminates the need for resins, glue or plastic scrims as stabilizers; allowing your needle to glide smoothly through our fine batting. Like natural fibers, this soft fine denier resists bearding, and is warm, yet breathable. 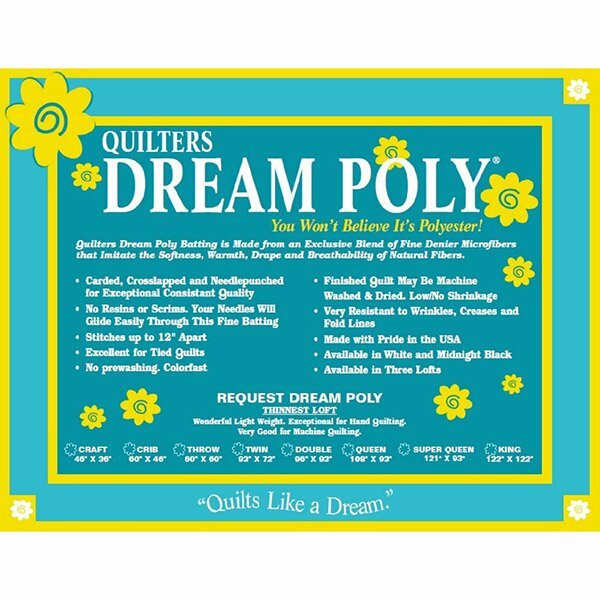 Dream Poly resists bunching and shifting and is strong enough to stitch up to 12" apart allowing the quilter more freedom of design.